A team of astronomers looking at galaxies in the universe's distant past have discovered nine young, compact galaxies, each weighing in at 200 billion times the mass of the Sun. Imagine receiving an announcement touting the birth of a baby 20 inches long and weighing 180 pounds. The astronomers received a similarly perplexing message from their observations of the distant galaxies. The galaxies, each only 5,000 light-years across, are a fraction of the size of today's grownup galaxies but contain approximately the same number of stars. 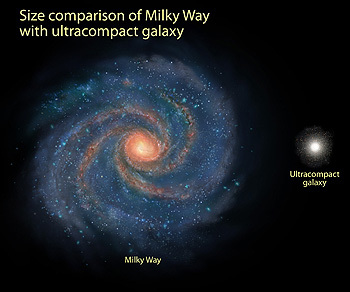 Each galaxy could fit inside the central hub of our Milky Way Galaxy. The team included four researchers at UC Santa Cruz: Garth Illingworth, professor of astronomy and astrophysics; postdoctoral researchers Bradford Holden and Rychard Bouwens, and programmer analyst Daniel Magee. The researchers used NASA's Hubble Space Telescope and the W.M. Keck Observatory on Mauna Kea, Hawaii, to study the galaxies as they existed 11 billion years ago, when the universe was less than 3 billion years old. "Seeing the compact sizes of these galaxies is a puzzle," said Pieter G. van Dokkum of Yale University, who led the study. "No massive galaxy at this distance has ever been observed to be so compact. These galaxies would have to change a lot over 11 billion years, growing five times bigger. They could get larger by colliding with other galaxies, but such collisions may not be the complete answer. It is not yet clear how they would build themselves up to become the large galaxies we see today." To determine the sizes of the galaxies, the team used the Near Infrared Camera and Multi-Object Spectrometer on Hubble. The Keck observations were carried out with assistance of laser-guided adaptive optics to correct for image blurring caused by the Earth's atmosphere. "Only Hubble and Keck can see the sizes of these galaxies because they are very small and far away," van Dokkum explained. According to Illingworth, these galaxies are ideal targets for the Wide Field Camera 3, which is scheduled to be installed aboard Hubble during Servicing Mission 4 in the fall of 2008. "We hope to use the Wide Field Camera 3 to find thousands of these galaxies. The Hubble images, together with the laser adaptive optics at Keck and similar large telescopes, should lead to a better understanding of the evolution of galaxies early in the life of the universe," Illingworth said. In 2006, the researchers studied the galaxies with the Gemini South Telescope Near-Infrared Spectrograph. Those observations provided the galaxies' distances and showed that the stars are half a billion to a billion years old and that the most massive stars had already exploded as supernovae. The ultra-dense galaxies might comprise half of all galaxies of that mass 11 billion years ago, van Dokkum said, forming the building blocks of today's largest galaxies. "In the Hubble Deep Field, astronomers found that star-forming galaxies are small," said Marijn Franx of Leiden University, The Netherlands. "However, these galaxies were also very low in mass. They weigh much less than our Milky Way. Our study, which surveyed a much larger area than in the Hubble Deep Field, surprisingly shows that galaxies with the same weight as our Milky Way were also very small in the past. All galaxies look really different in early times, even massive ones that formed their stars early." Based on the galaxies' mass, which is derived from their color, the astronomers estimated that the stars are spinning around their galactic disks at roughly 890,000 to 1 million miles an hour (400 to 500 kilometers a second). Stars in today's galaxies, by contrast, are traveling at about half that speed because they are larger and rotate more slowly than the compact galaxies. The findings appeared in the April 10 issue of Astrophysical Journal Letters. For images and more information about the compact galaxies, visit the Hubble web site. The Hubble Space Telescope is a project of international cooperation between NASA and the European Space Agency (ESA) and is managed by NASA's Goddard Space Flight Center (GSFC) in Greenbelt, Md. The Space Telescope Science Institute (STScI) conducts Hubble science operations. The institute is operated for NASA by the Association of Universities for Research in Astronomy, Inc., Washington, DC.